Foolproof Crispy Fries each and every time! Served here with a dreamy Miso Tahini dipping sauce. Savory, Salty & Addictively Delicious! 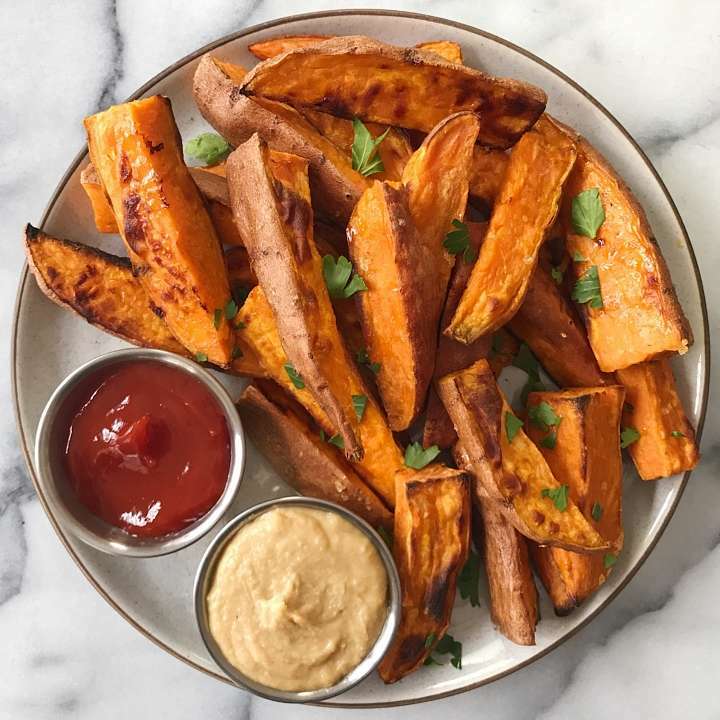 Crispy, baked SWEET POTATO WEDGES with Miso Tahini dipping sauce … because FriYAY. It was only a 4 day school week but I’m really looking forward to sleeping past 6am tomorrow … anyone else? So in honor of that FriYAY feeling, it seemed only appropriate that fries were on tonight’s menu. Ketchup for the boys and the dreamiest MISO TAHINI dipping sauce, recipe from Bon Appetit , for me! Every time I post potato fries, I get lots of messages about how I get them so crispy so here are some simple tips so your fries will be perfectly crisp and yummy every time! Make sure they are well coated but not dripping in oil and place on an ungreased baking sheet or baking sheet covered in non stick foil. Place them on the baking sheet so that they are not touching and with enough space in between each sweet potato wedge so that they can get crispy. Crispy Baked Sweet Potato Fries have never been easier! Paired with a Miso Tahini Sauce from Bon Appetit or more classically with ketchup or even guacamole, they are savory, salty and addictively delicious. Make sure sweet potatoes are dried well. Place sweet potato wedges in a large bowl and toss evenly with oil. (You want the fries to be coated but not dripping in oil). Place oiled fries in a single layer on ungreased baking sheet or baking sheet covered in non stick foil. Make sure sweet potatoes are not touching and that there is room between each sweet potato so that they can get crispy. Serve immediately. If extras, store in a seal container in fridge and reheat in oven or stove top.